It’s a quiet night as snow falls on a little cabin in the woods. Deer, drawn to the soft light filling the windows and the warmth of the cabin stand motionless in the snow. 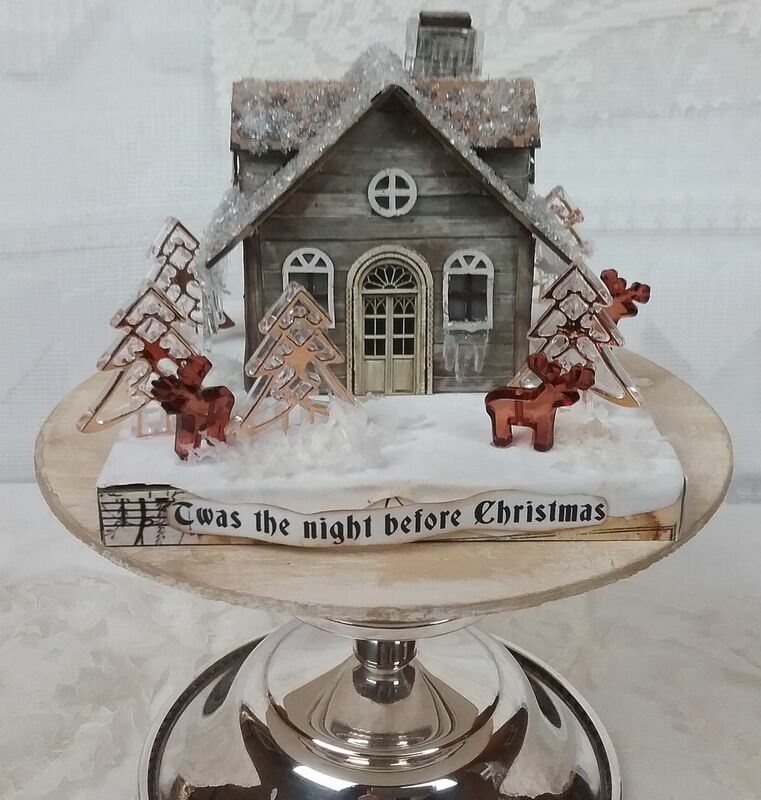 This magical scene is made with Alpha Stamps new House Ornament Chimney & Dormers and the House Ornament Base. 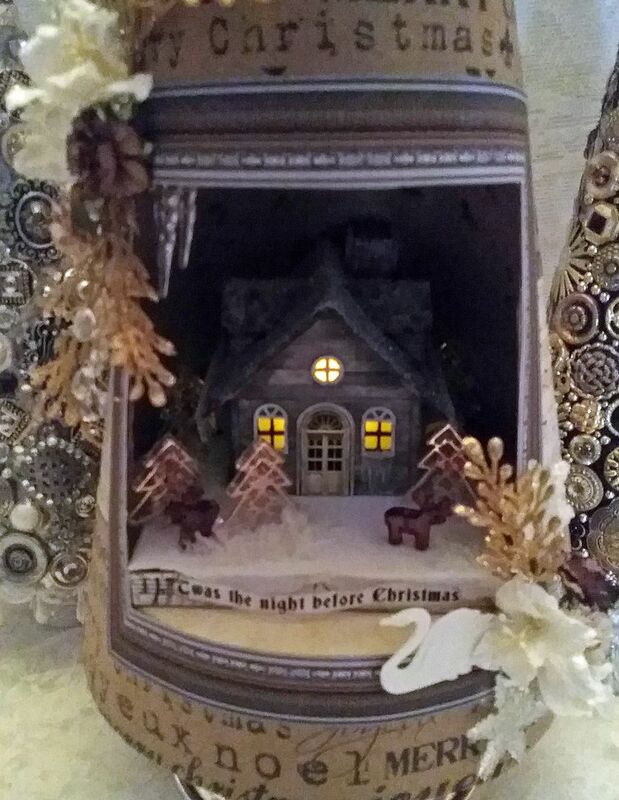 The little cottage in the woods is tucked into a paper tree made using some of Alpha Stamps new Christmas scrapbooking papers. I thought it would be a fun change to use a color scheme that is soft and muted, rather than my usual colorful projects. 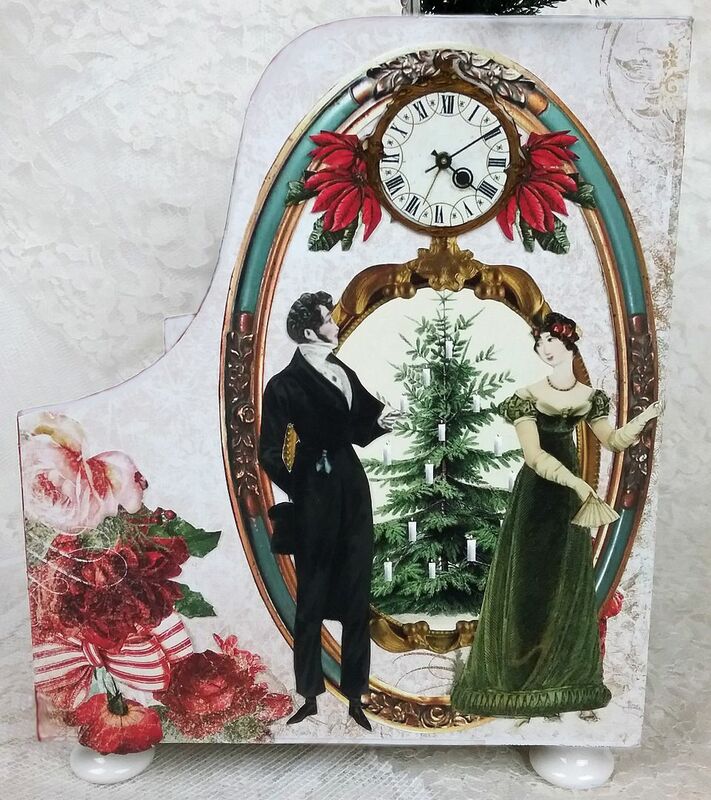 I wish I had more time this holiday season as I think a series of these in different heights would look so lovely arranged on a fireplace mantel. Instead, I paired them with my Jeweled Trees from a previous season. If you missed my Tutorial on making Jeweled Trees click here. For an added touch, the little cottage is lit with a tea light giving the scene a soft glow. 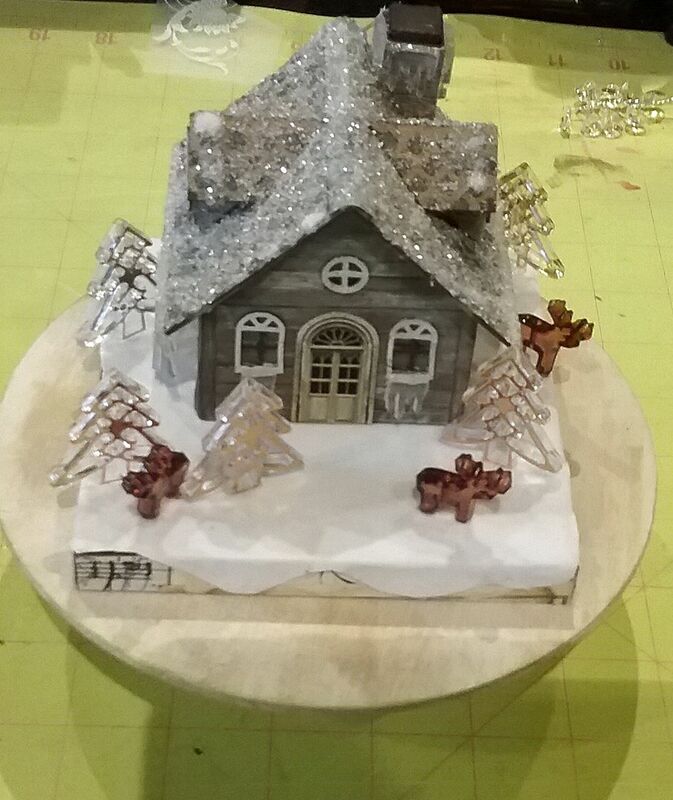 I added sparkle to the house and snowflakes on the outside decor using Twinklets Diamond Dust. 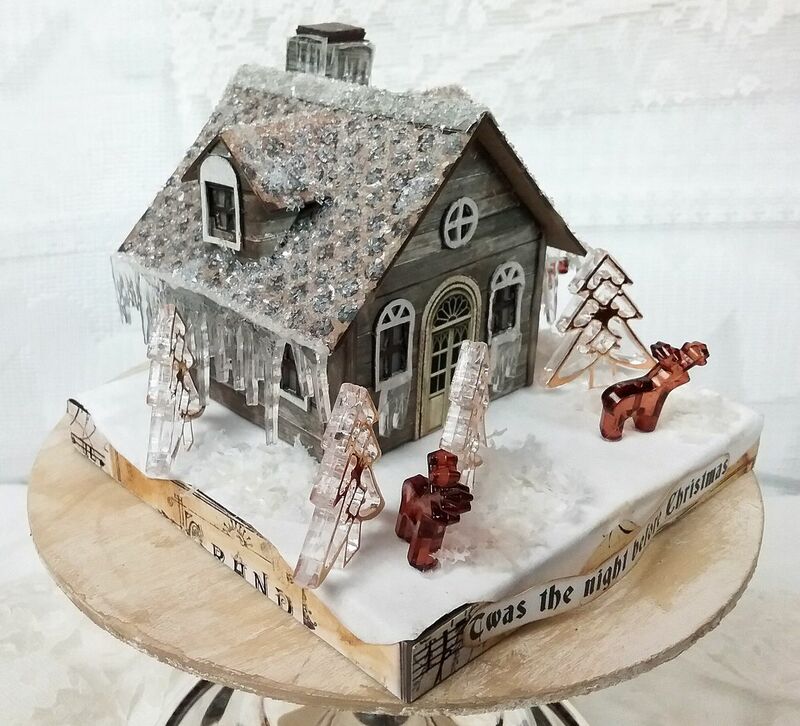 The cute trees and reindeer are acrylic beads and the snow is faux white suede paper. The opening in the cone is accented with a new frame from my Vintage Frames Download Set. 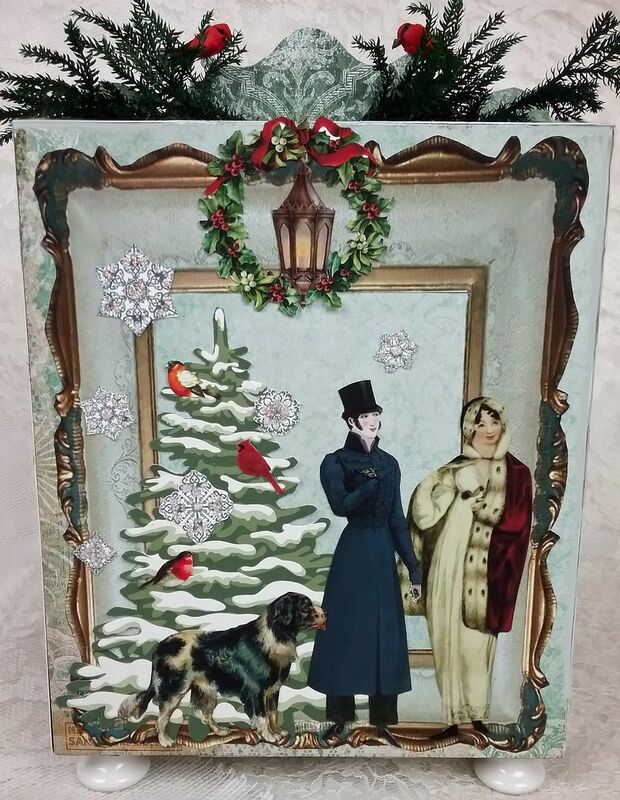 On each side of the frame, I added decorative flowers, acrylic sprays, snowflakes, glittered sprays and some acrylic icicles. The base of the tree is a small silver bowl turned upside down. 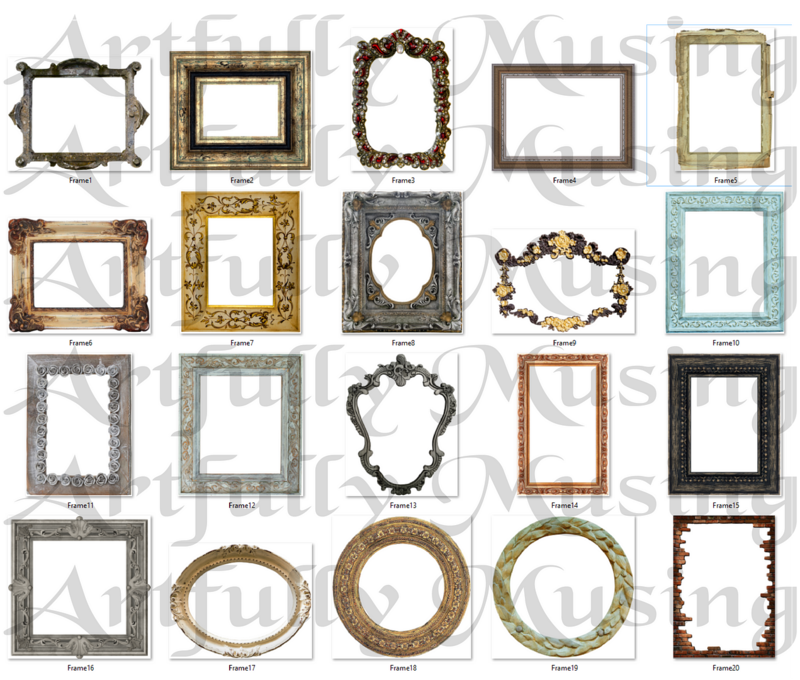 I love using frames in my projects and to add to my two other digital framesets is this new Vintage Frames set which includes 20 new frames. No doubt you will see me use some of these in future projects. All of the images in the set can be re-sized for your project as they are high resolution (300dpi) PNG formatted images. The first thing I need to work out was adding the tea light. Many times I work with sample kits which may be slightly different than the final version. This was the case with this house, as the final version has a trap door in the floor, so you don't need to make a hole like I did to accommodate the light. In the picture above you can see the kit and the trap door which replaces what I did in the picture below. 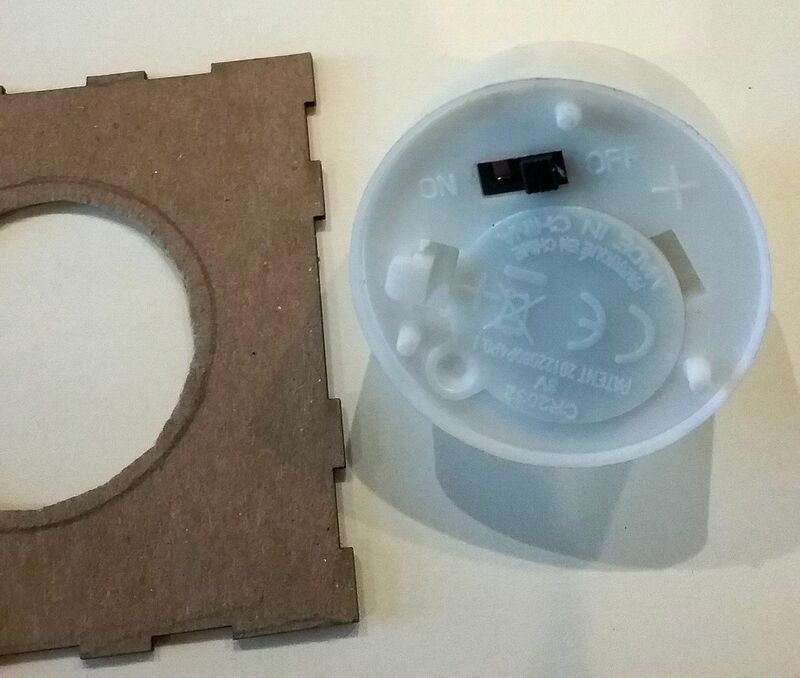 If you want to use the base with a tea light and are gluing the house to the base, then you need to cut holes in the top and bottom of the base in order to reach the tea light switch and to replace the battery. 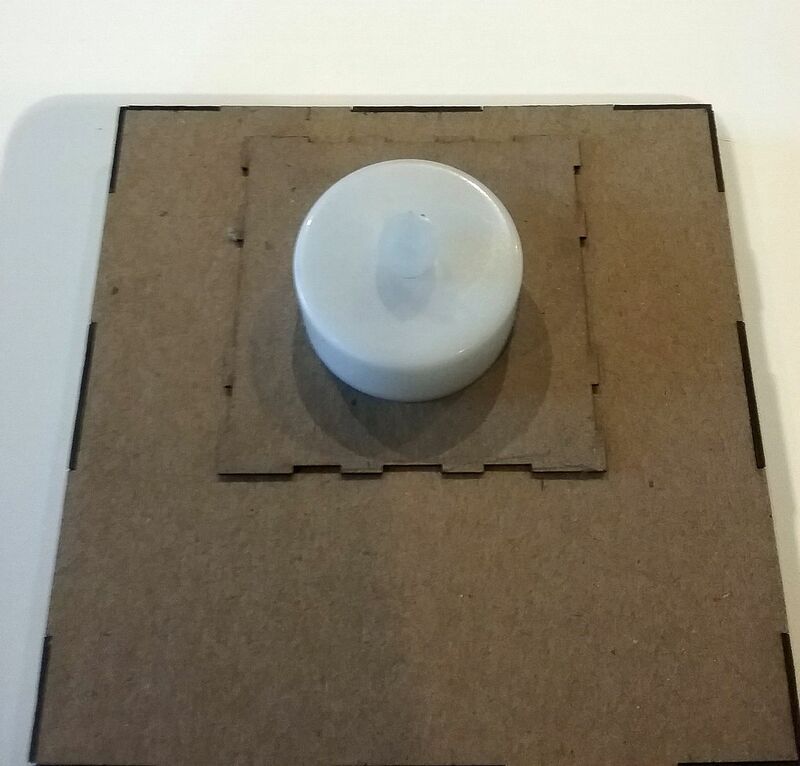 For my house, I glued the tea light to the floor of the house (over the round hole). After I finished decorating the base and the house I glued the house to the base with the tea light over the square holes. This gave me access to the tea light from under the base and house. I painted all of the windows. You see two different colors (cream and brown) because I changed my mind. The cream was too light against the paper I was going to use on the sides. Next, I glued pieces of vellum to the backs of the windows. I then glued the front, back and sides to the base (with tea light already glued in place). The soft brown and grey wood patterned paper from the Christmas Delivery 6 x 6 paper pad was perfect for the siding. I cut it in smaller strips before gluing on to the house. 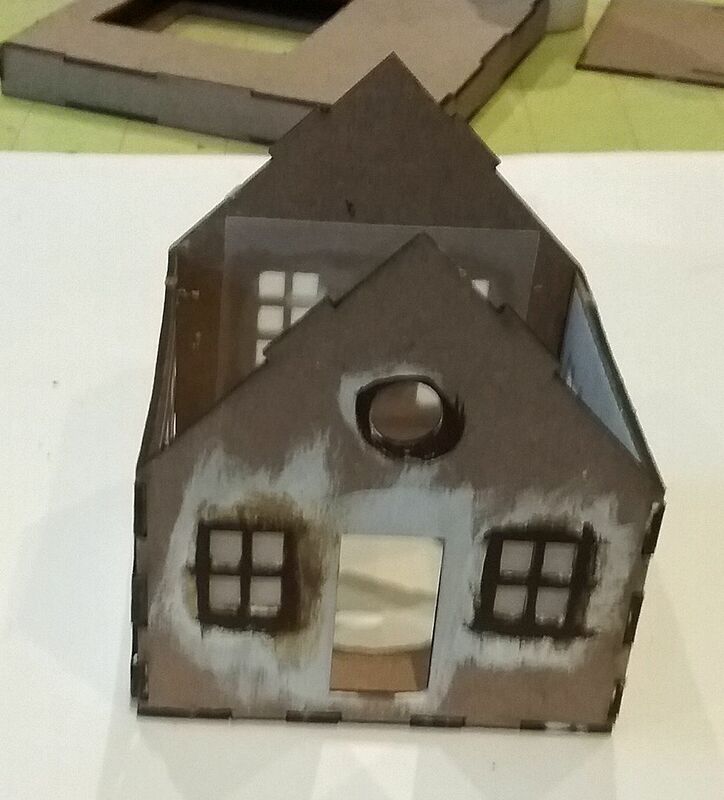 For the roof, I used the Tiny Shingles Stencil to apply brown shingles. 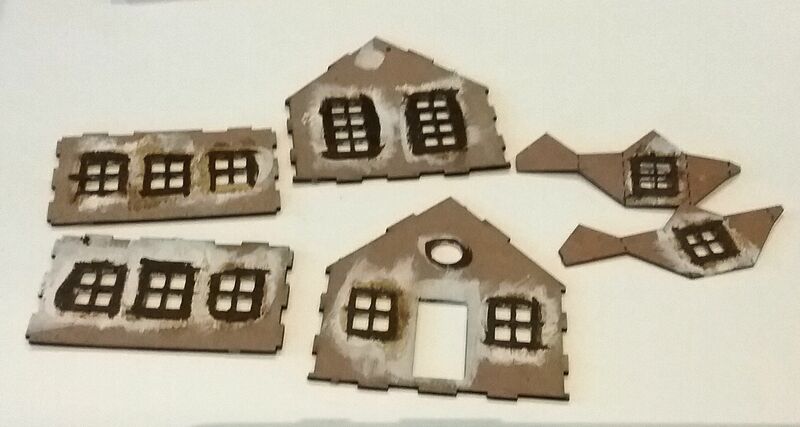 Using glue I covered the roof, dormers, and chimney with Diamond Dust. I added scrapbook paper to the base and then the faux white suede paper. I started by determining the dimensions of the tree. 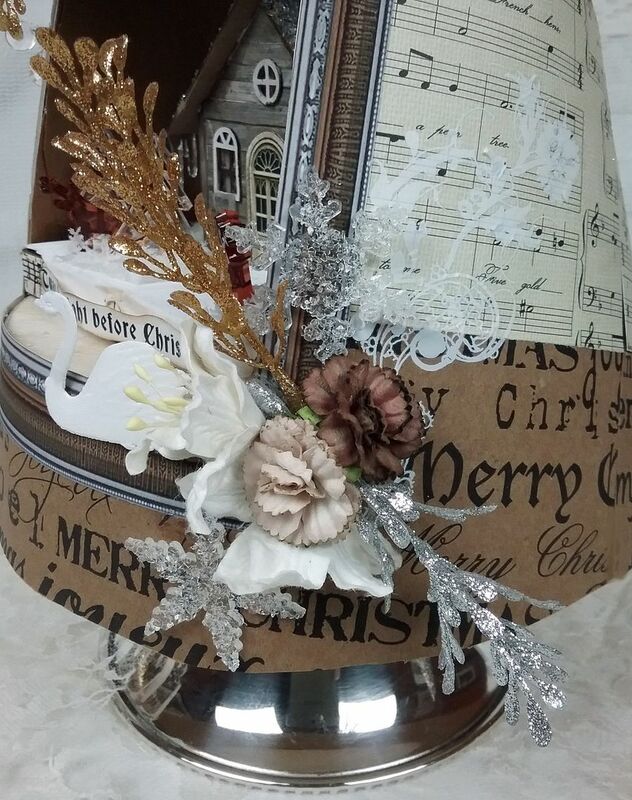 The paper I used for the base is the kind you use to wrap packages for mailing. I choose it because of its size and thickness, plus since it comes in a roll it wants to roll up naturally. 1. The size of the base (round wood base) is a guide to the width of the bottom of the tree. 2. The tree needs to be tall enough to accommodate the opening and the base and look balanced. 3. The opening needs to be large enough to see the house and to remove it (if you need access to the light). The circumference of my round wooden base is 21”. You'll want to add extra for wrapping and gluing the edges. 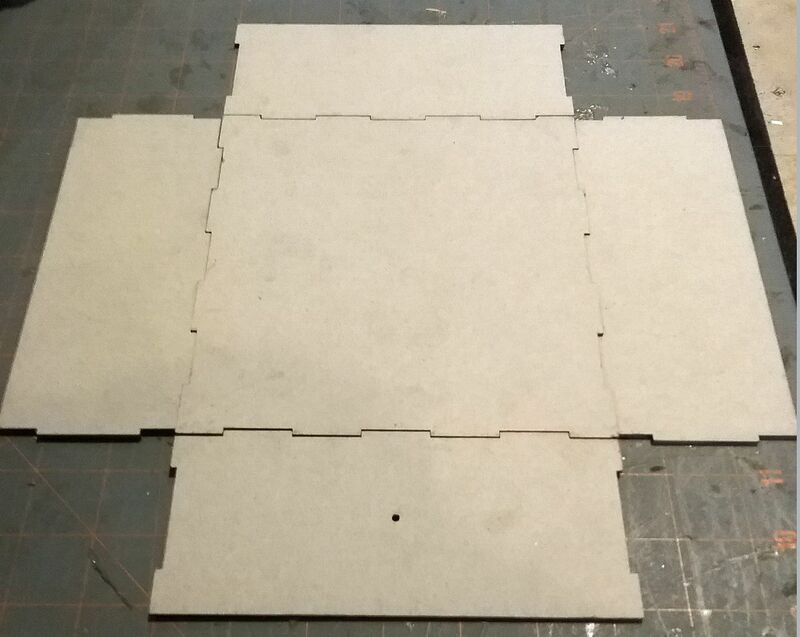 Better to have the base too wide than too narrow, as you can overlap the edges more when gluing them together. Also, the tree gets narrower as it goes up from the bottom so it has to be large enough that when you insert the wooden round base inside it will fit. The round wooden base will be a few inches up inside the tree where it is narrower than at the of the base of the tree. 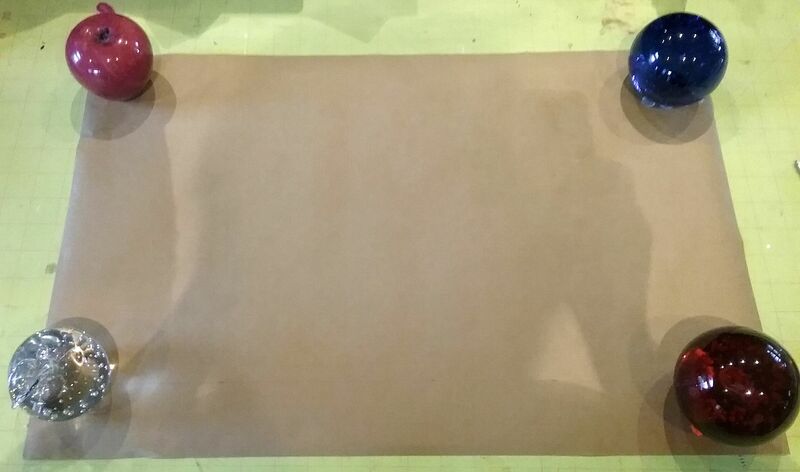 I cut out a piece of the wrapping paper that was 26” wide. The height of the paper at this point didn’t matter as the paper was more than high enough. 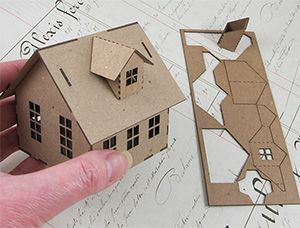 For the opening measurement, I used 5” by 5” which was large enough to see the scene and to remove the house and chipboard base to access the light. 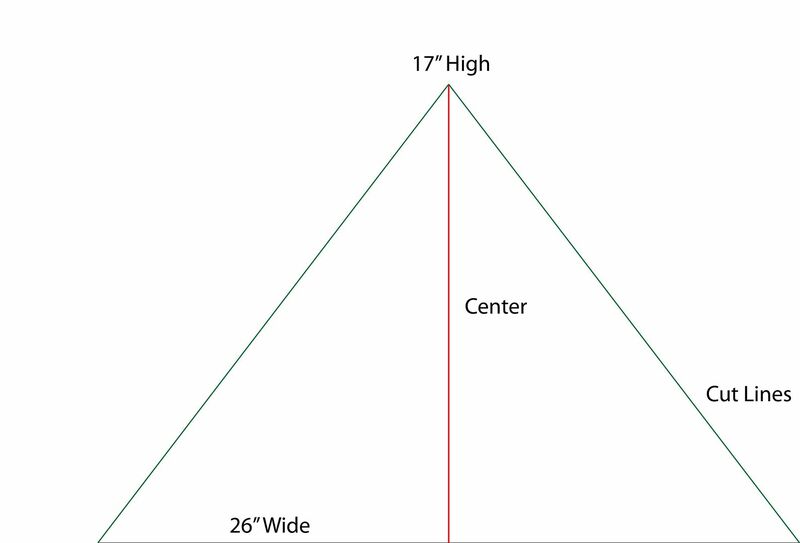 The size of the hole and placement are factors in determining the tree height. I decided I wanted the hole to start 2" above the bottom of the tree. The round wooden base will be glued inside the tree just a little bit lower than the bottom of the opening. 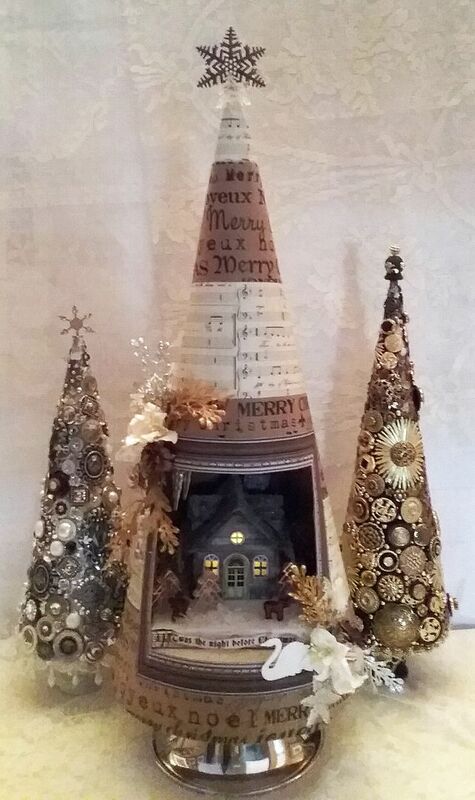 The 2" of the tree at the bottom covers the candlestick holder and the very top of the silver bowl. See in the picture below where the hole will be. Also, notice how the hole is centered. I decided to use 17” for the height by kind of trial and error method. I had allowed 2" for the bottom plus the 5" for the hole which was a total of 7". 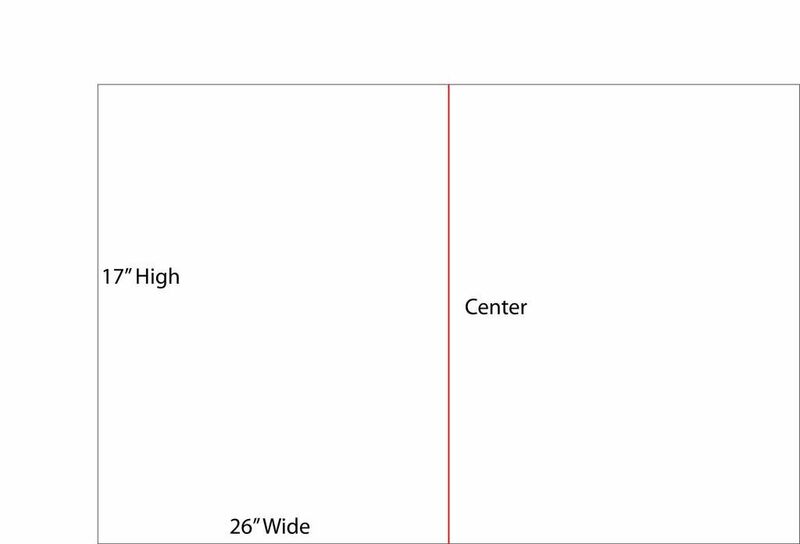 To determine how much more to add to the height I rolled the paper into a tree shape and decided what height looked the best. Too short and you won’t have enough room in the tree for the house, too tall and the piece looks unbalanced (too much tree above the opening). I decide to add another 10" to the tree height which gave me a total of 10". 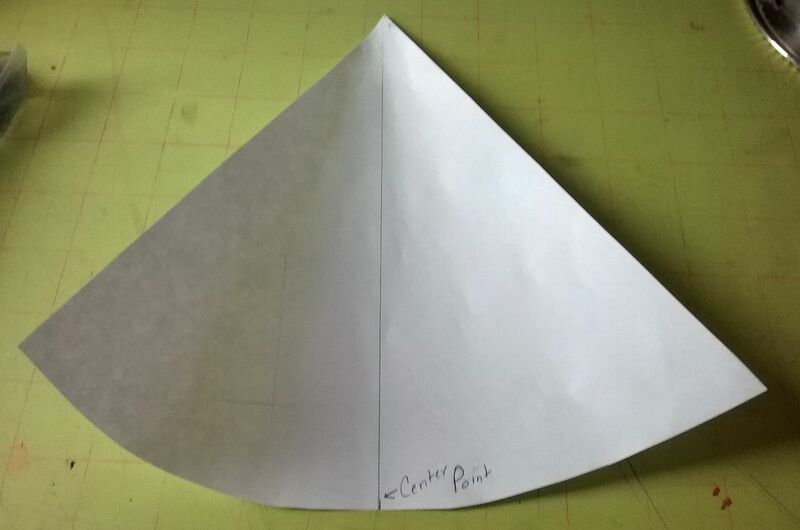 Next, I cut out a triangle. From the center of the base measure up 17" and mark. Next, draw a line from the mark at the top to each edge of the base (green lines). Cut along the lines and you have your triangle. 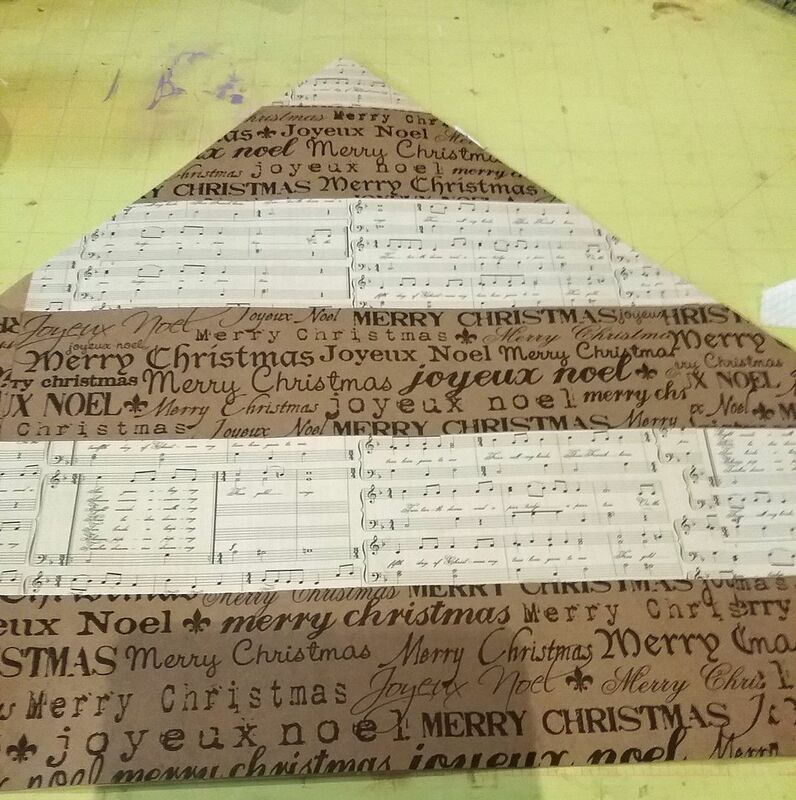 I decided to cut 2 different papers into strips and glue them to the wrapping paper at an angle. 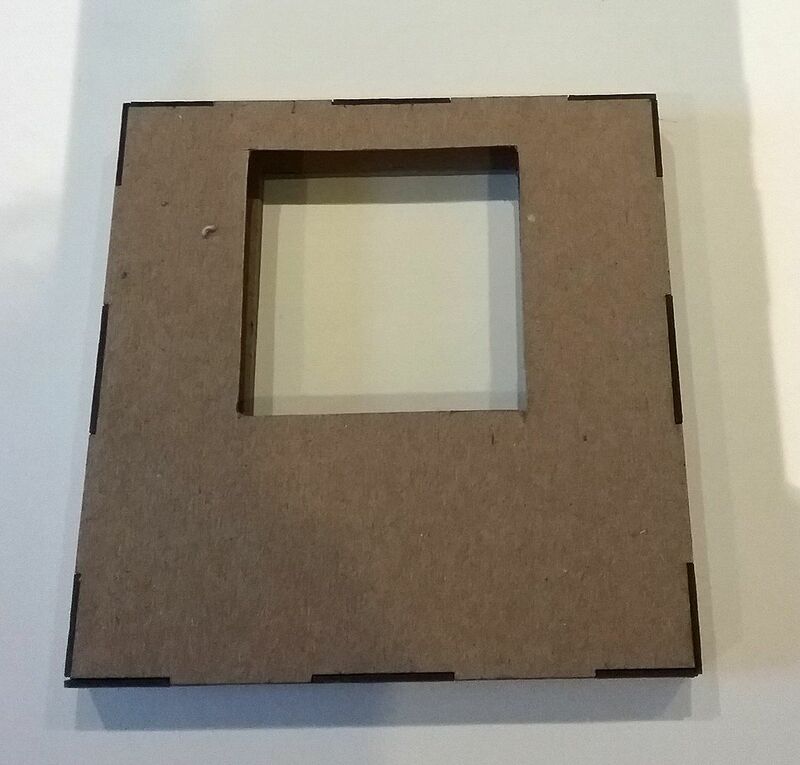 I marked and cut open the hole (see the diagram below) then glued the frame from the Vintage Frames download set over the hole. Since the frames are .png files you can size them to fit your hole. Next, I applied some white rub-ons from my stash to the sides of the opening. Before gluing the tree edges together into a cone shape you need to level out the bottom of the tree as it will not be even on the bottom. 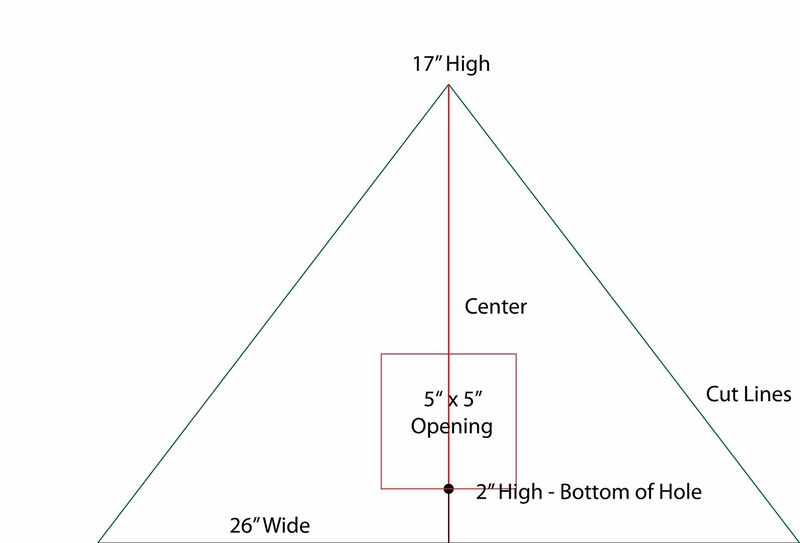 The bottom of the triangle shape needs to be rounded. 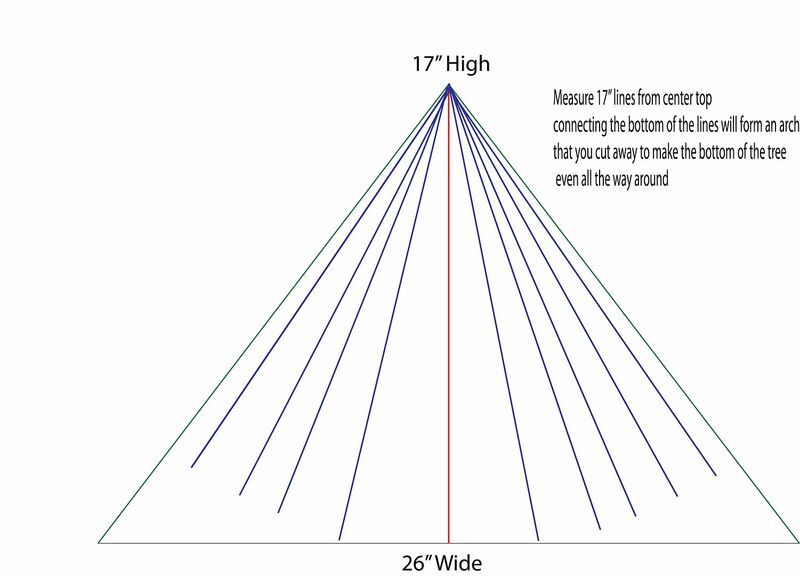 Using the height measurement (17”), measure from the top point to the base and mark, moving along the base marking 17" inch or so. Once you have marked the entire bottom of the tree use those marks (blue lines below) as a guide to cut away the paper and you will have a rounded bottom which will be even when you glue the edges together. Glue the edges of the tree together (they should overlap) forming a cone shape. Being mindful of the diameter of the base. I suggest checking that the base will fit in the bottom before gluing in this case 2" up from the bottom (I clipped an marked mine before gluing). Remember that 2" up in the cone it is not ad large around as it is in the base. In the case of my tree, the round wooden base was 21" around but my base at the bottom is bigger so that 2" up it is 21" around. 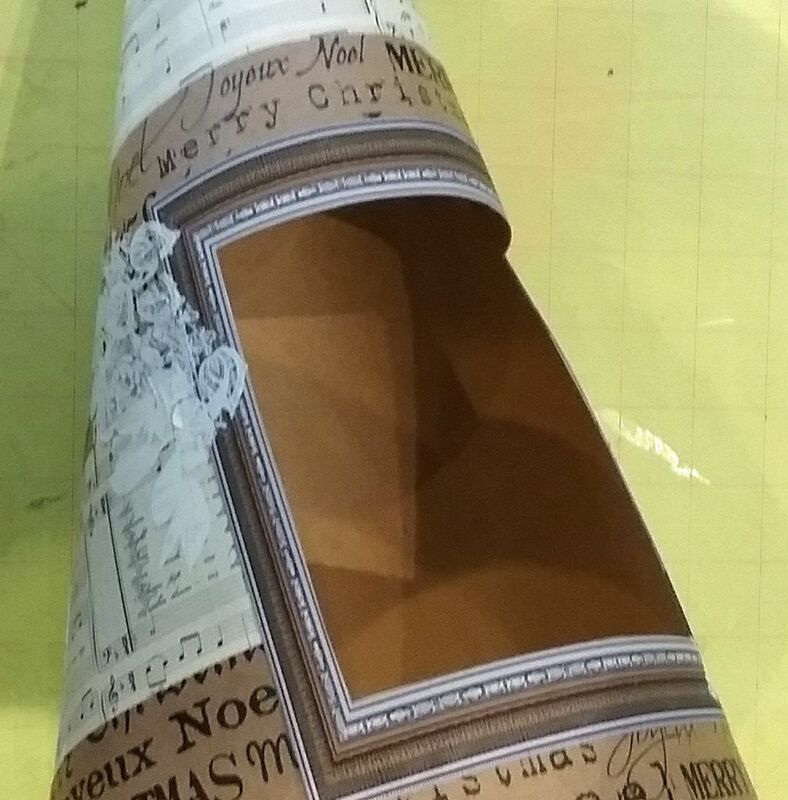 I added more of the wrapping paper to the inside of the tree to cover the seam where the sides are glued together. The color of the wrapping paper worked fine for the color scheme I was using. 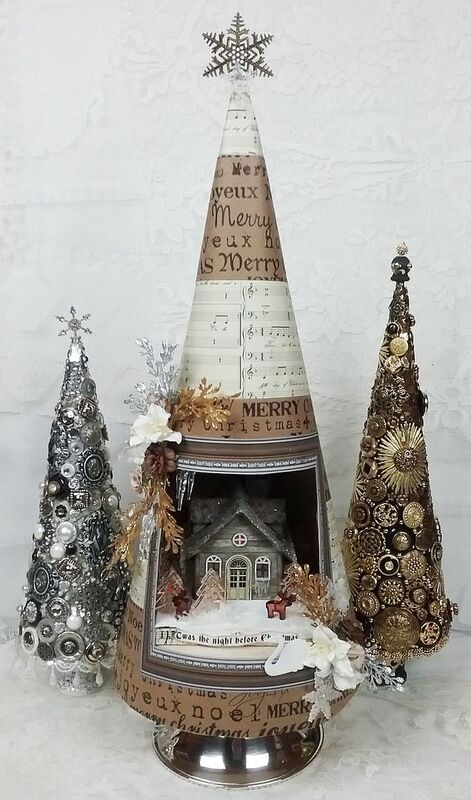 I also glue gold and silver stars to the inside of the tree. 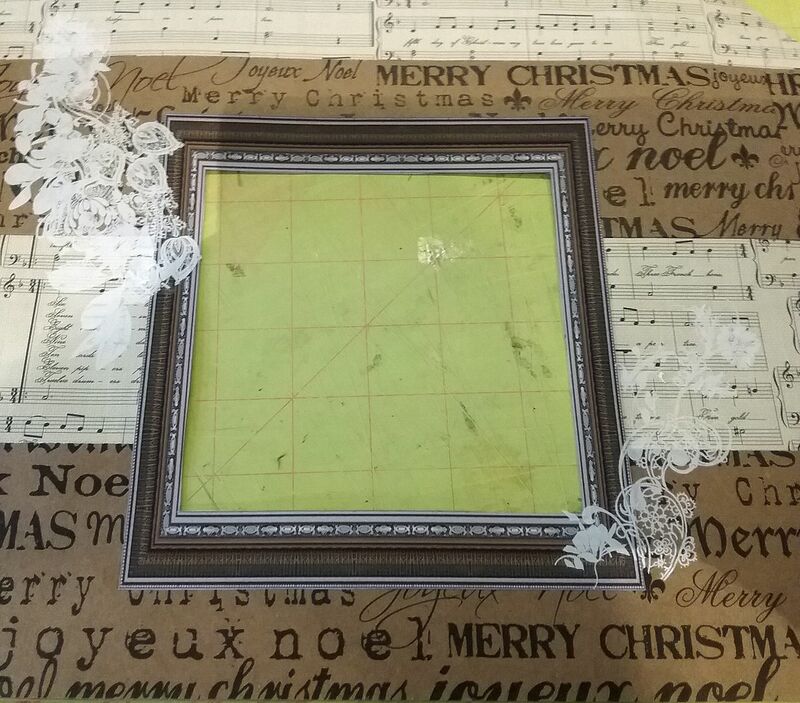 Next, I added all of the embellishments to the sides of the frame. At this point, I had not yet glued thee the round wooden base inside the tree. The round wood base is from my stash. 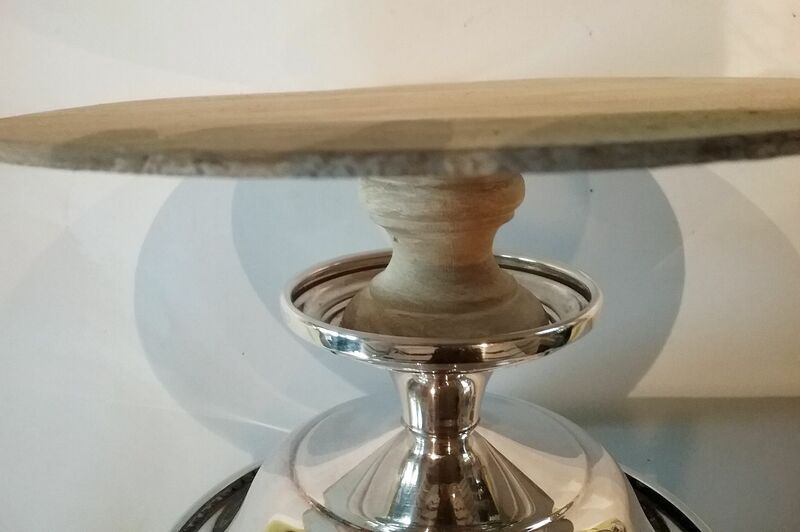 I glued a wooden candlestick holder to the round wood base. 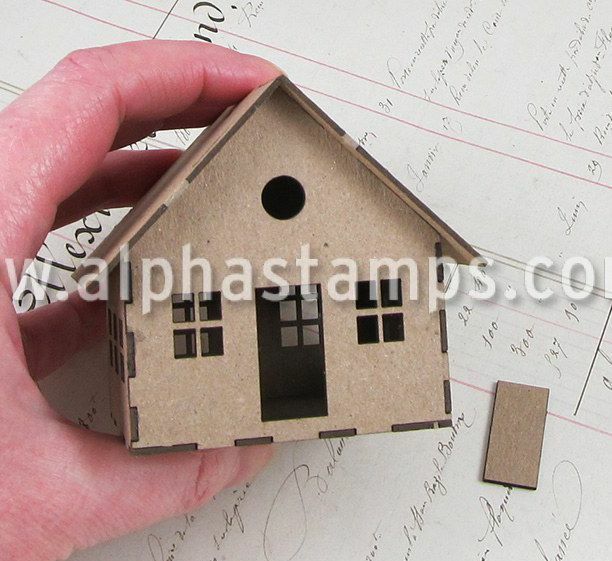 The combination chipboard house and base are NOT glued to the round wooden base. By not gluing it in place, I can remove it via the opening in the tree and turn the light on and off. 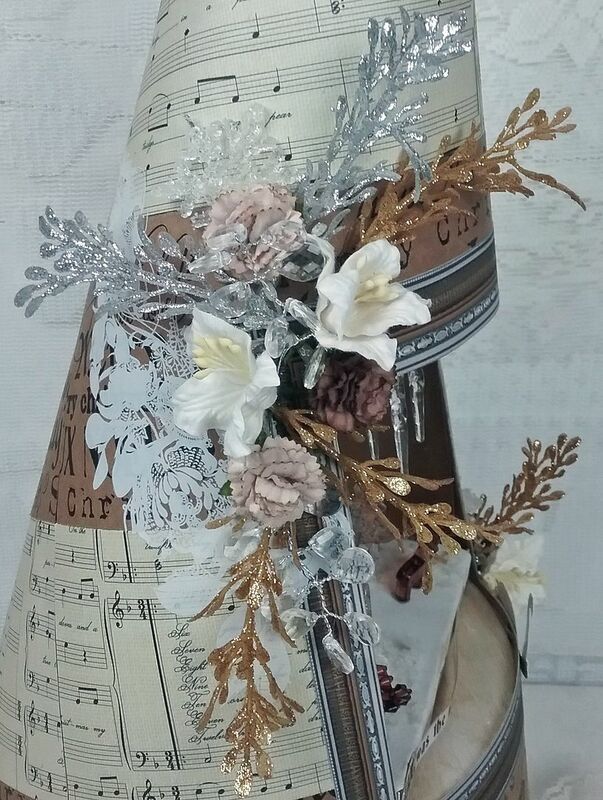 I had originally thought that I would just use the candlestick as the base but it didn’t make the stand high enough to appear at the right height in the opening and I didn’t think it had enough sparkle. 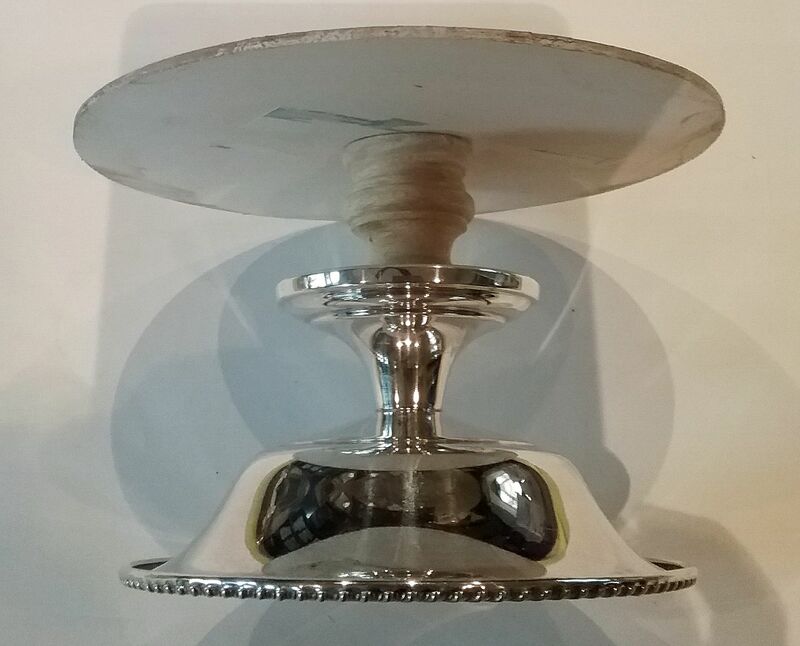 Next, I attached a silver bowl turned upside down to the candlestick holder using sticky dots. The reason I used the dots is that it makes it easy to remove the bowl from the candlestick holder (without damage) for polishing. 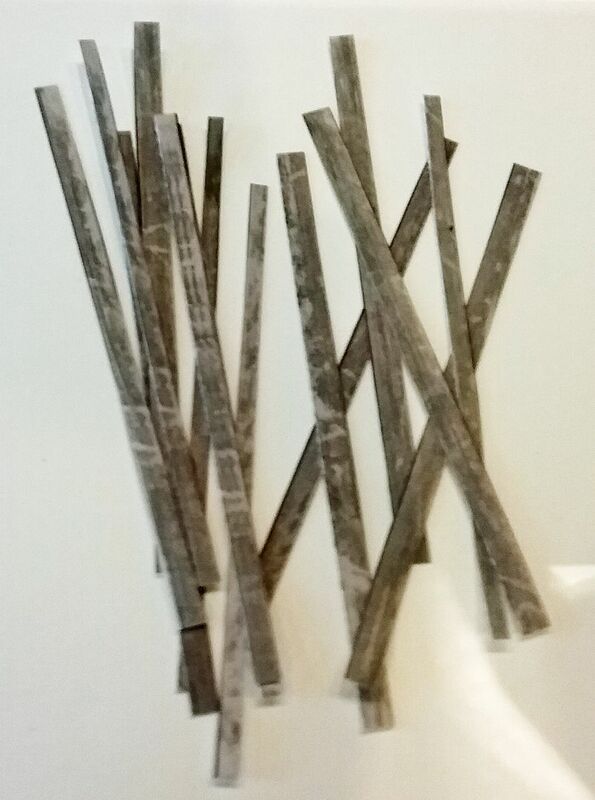 It is also easy to remove the sticky dots and replace them. 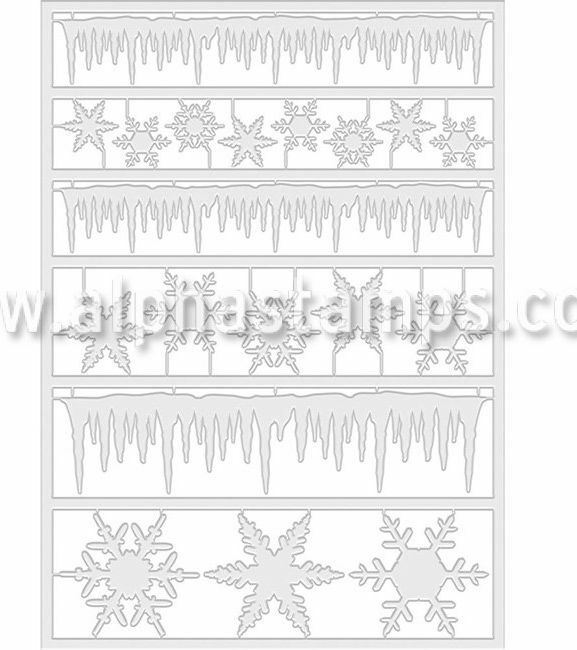 The final touch was the filigree star at the top with an acrylic snowflake (with Diamond dust). Notice in the picture below of the finished tree, I can remove the house to access the light switch. THIS IS MY LAST POST FOR 2016! I'LL BE BACK NEXT YEAR WITH NEW PROJECTS. I HOPE YOU AND YOURS HAVE A WONDERFUL HOLIDAY SEASON & A MERRY CHRISTMAS!! Tis the season to be jolly and I’m kicking things off with a versatile bookcase project. I say versatile because this has so many possibilities. 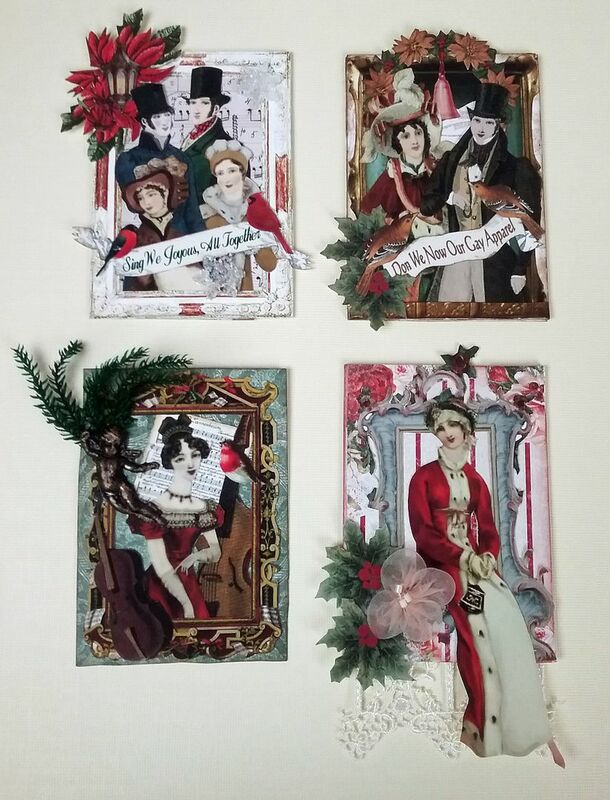 Since we are in the height of the holiday season I decided to go with a regency period Christmas theme because the Regency period is my favorite; it’s a Jane Austen thing. 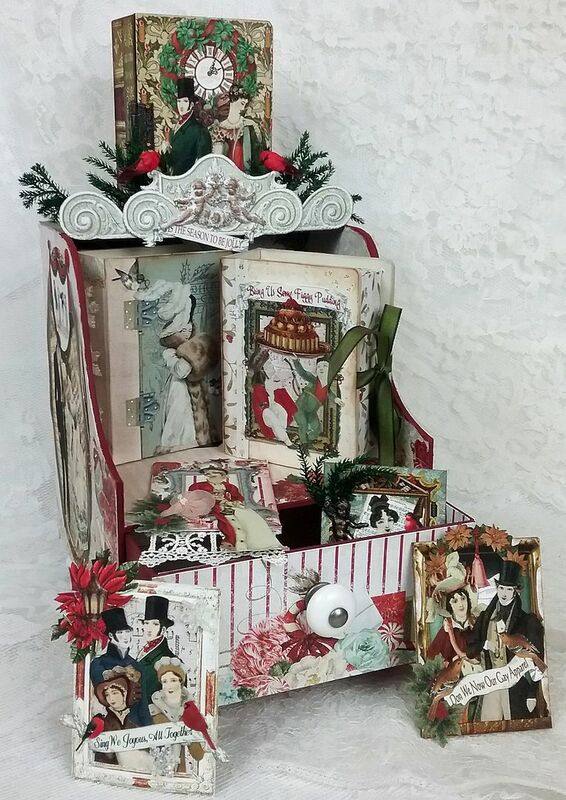 The generous side and back areas were perfect for creating scenes using my four new holiday collage sheets. 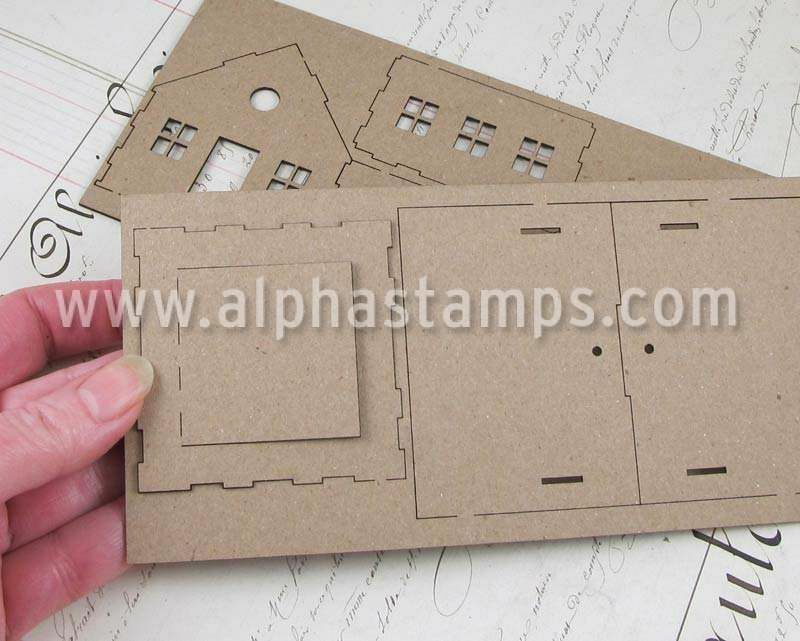 And speaking of new collage sheets, Alpha Stamps is giving one of them away free with purchase; you'll find the details below. 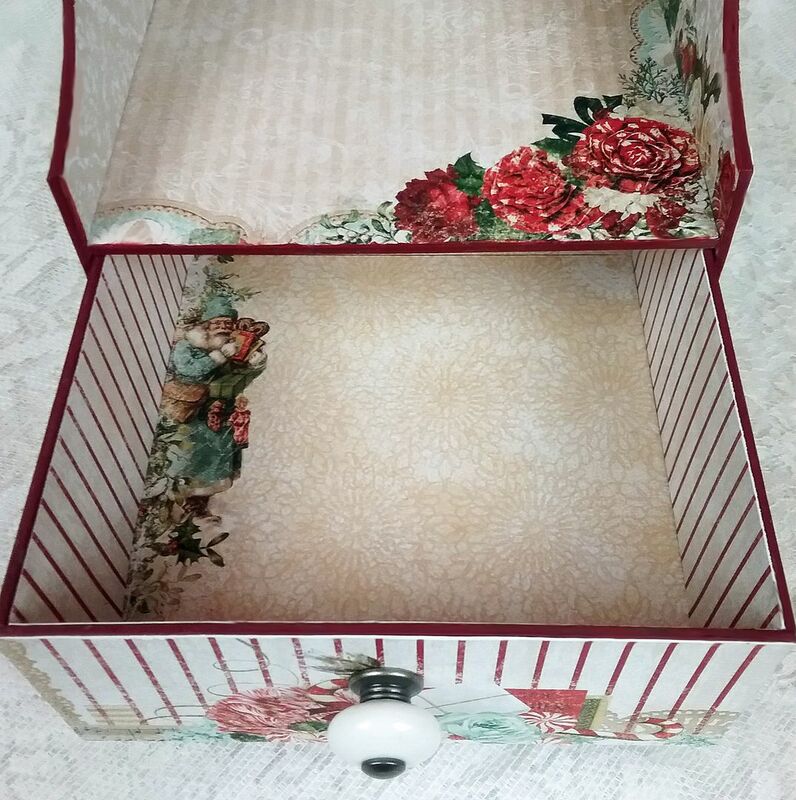 In the spacious drawer at the bottom of the bookcase, you can store all kinds of goodies. 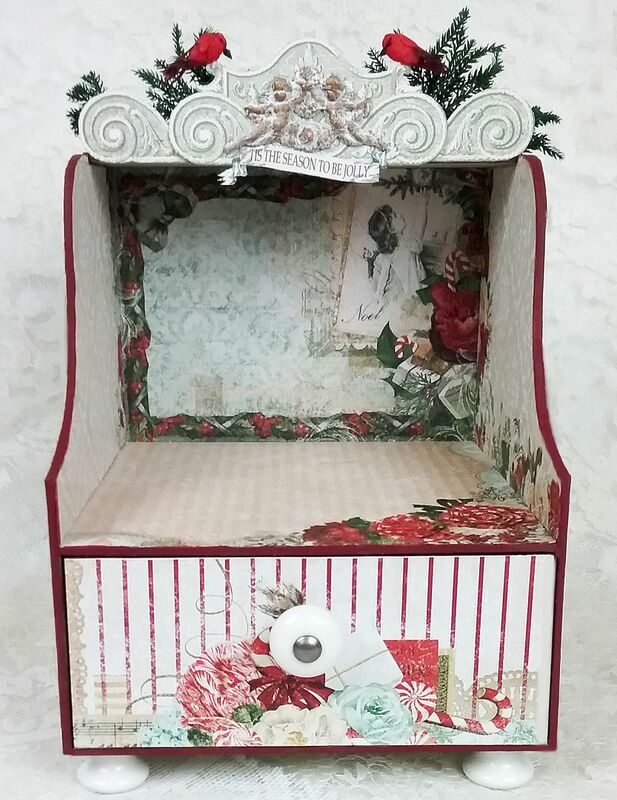 This bookcase just happens to be perfect for storing and displaying ATCs. 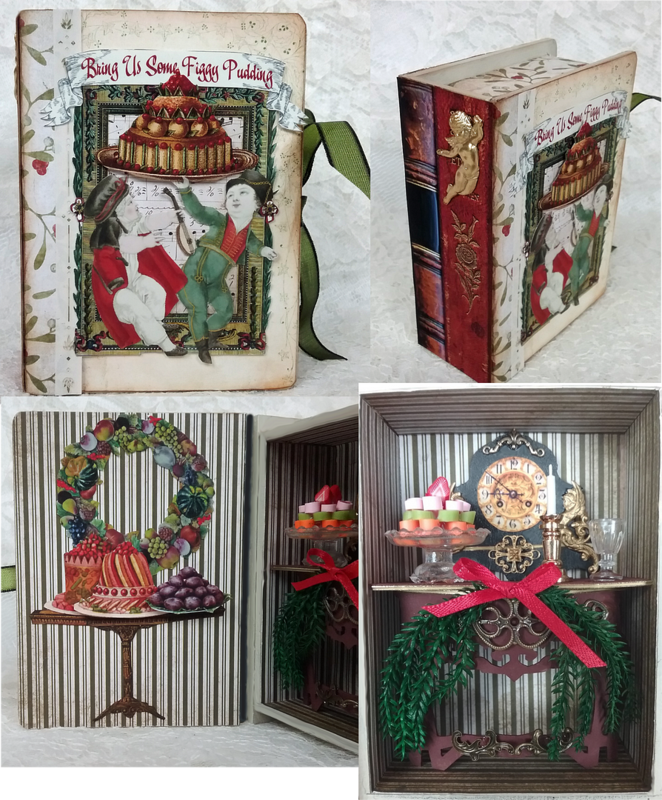 The books you see displayed in the cabinet are ATC sized and I’ve used them in a variety of ways. 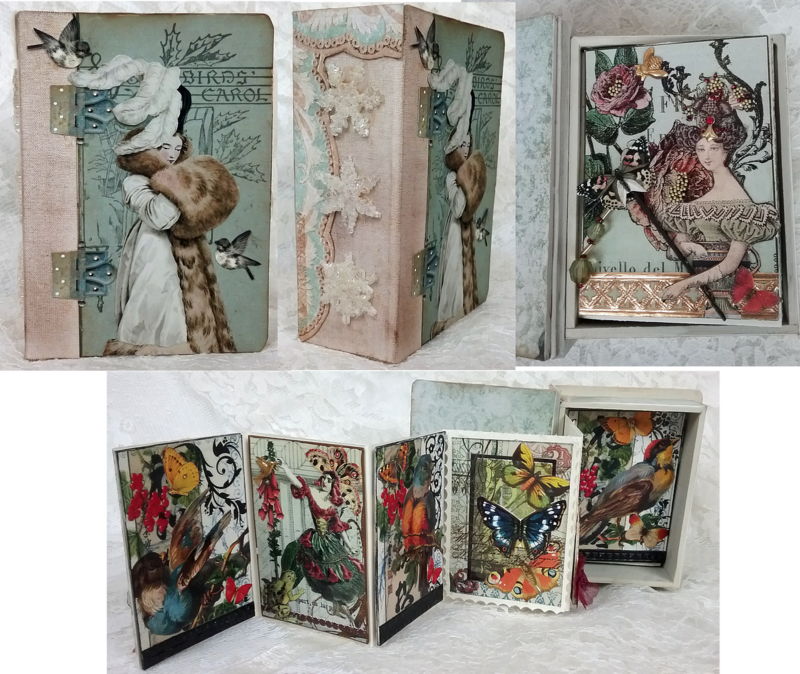 One book is an accordion folded book displaying ATCs, one contains a stack of ATCs and one is a shadow box book. 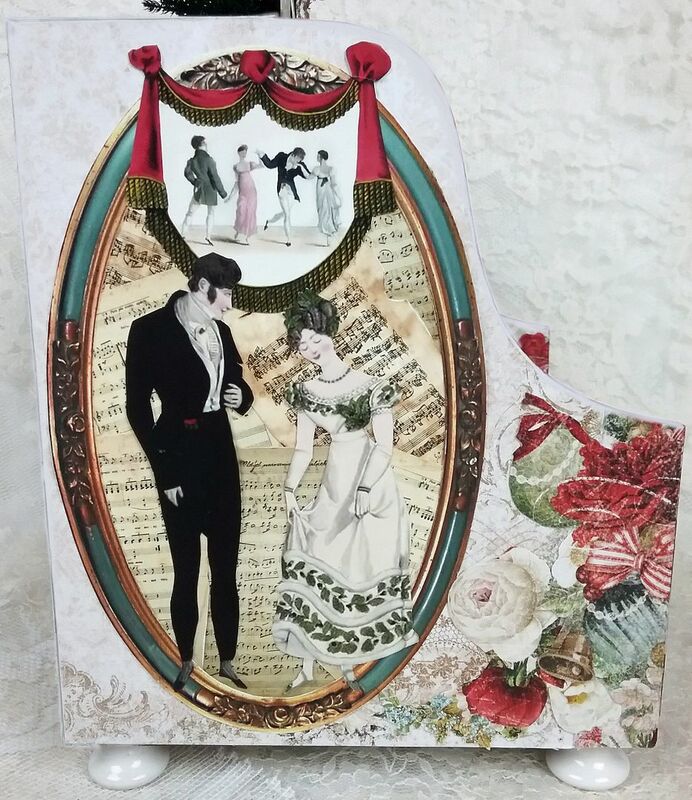 With all of the lovely new holiday vintage scrapbook papers that Alpha Stamps is carrying and my new collage sheet images, I couldn’t resist putting together a few ATCs. 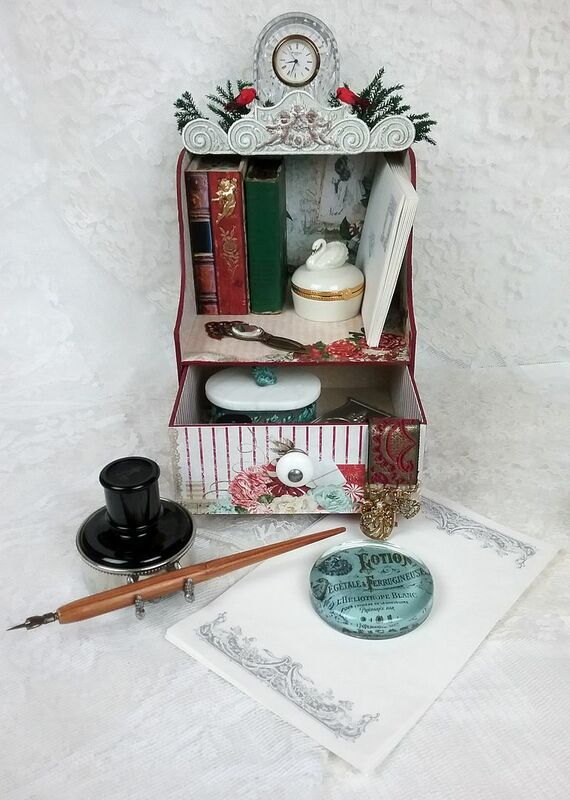 If ATCs are not your thing, I’ve staged the bookcase as a mini secretary. This bookcase would also work fabulously for storing and displaying this and future season's Christmas cards. 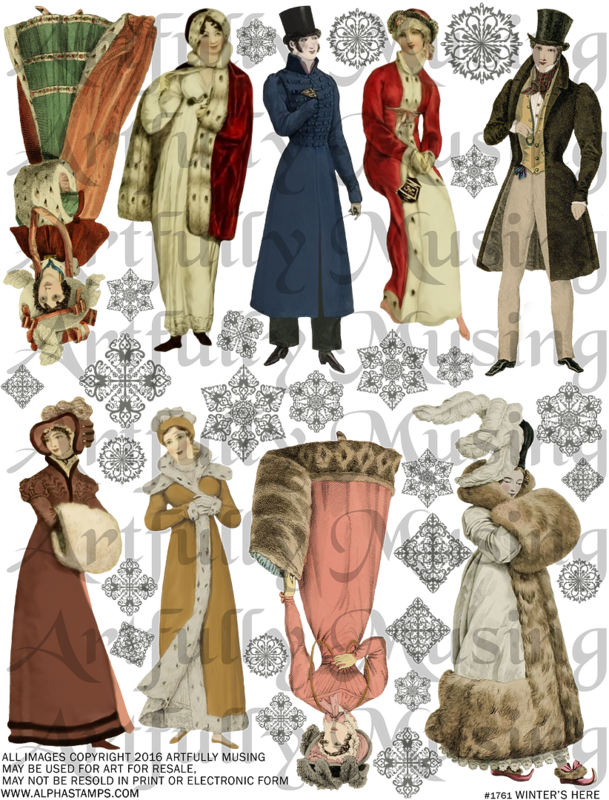 This collage sheet contains 9 regency period (Jane Austen) images of women and men in winter fashions surrounded by various sized and shaped snowflakes. 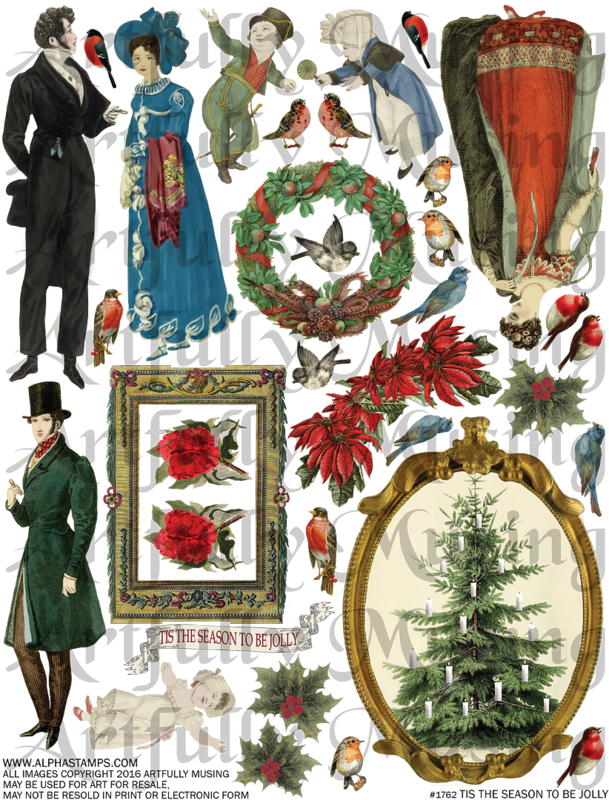 This sheet contains 6 regency period (Jane Austen) images of women, men, and children dressed for the holiday and various seasonal decorations. 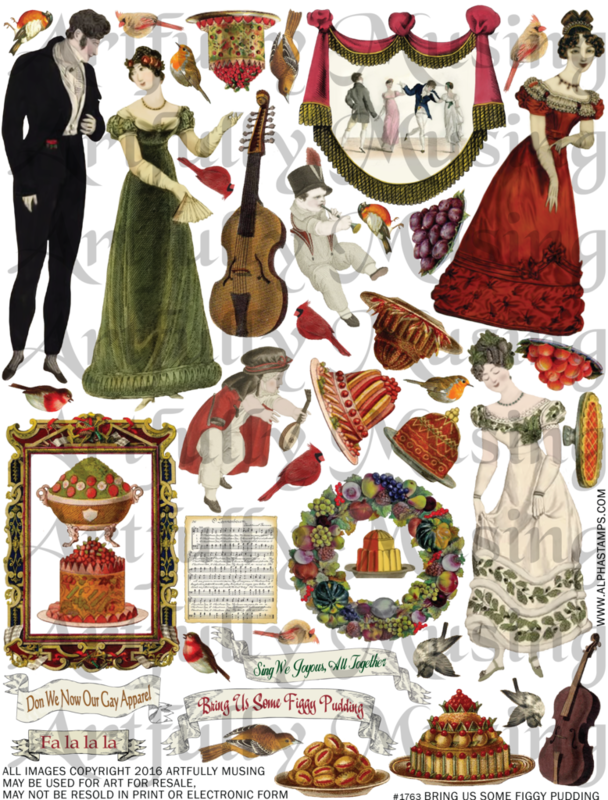 This sheet contains 6 regency period (Jane Austen) women, children, and men celebrating all the good things of the season such as music and seasonal food. Included are also other complementary items such as musical instruments, sheet music, a wreath of fruit, frames, banners, birds and tasty treats. 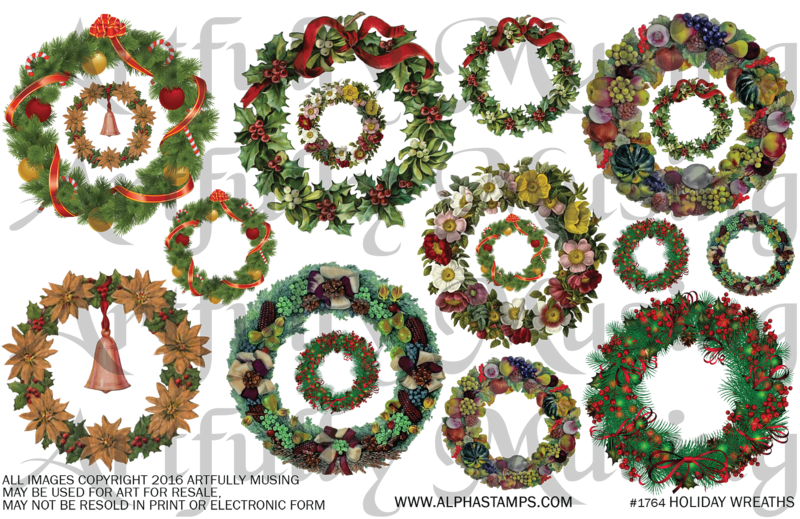 On this sheet, you’ll find 7 unique festive wreaths in multiple sizes for a total of 17 wreaths. 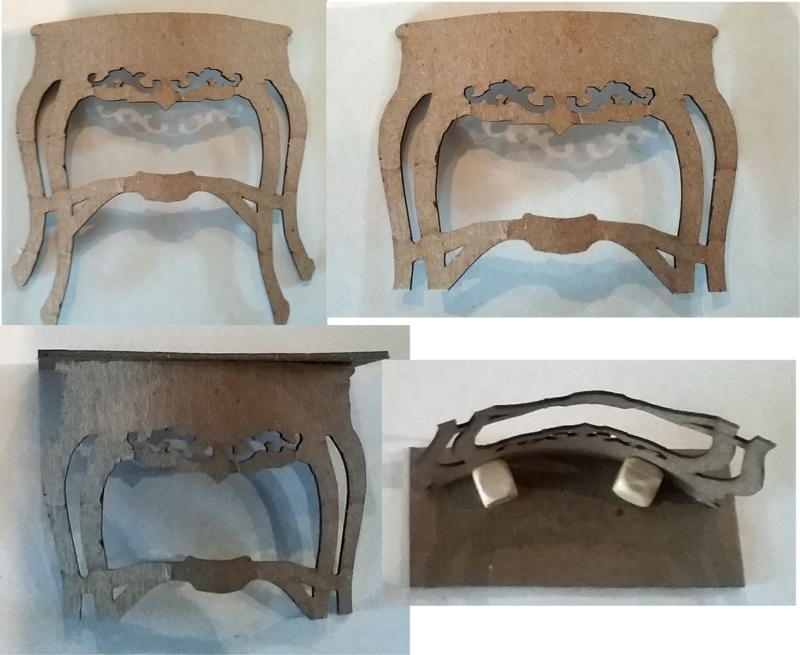 Below you’ll find some details on how I made various components of this project. The bookcase is made from an easy to assemble kit. 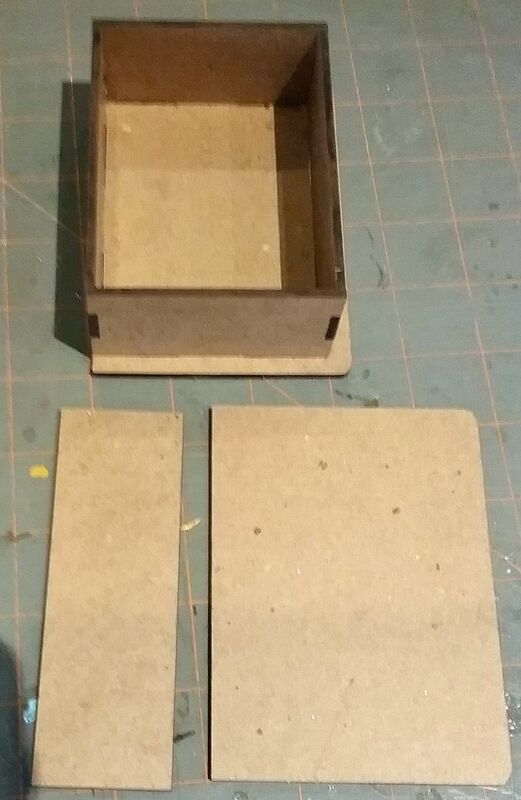 The main structure consists of a base, two sides, a back piece, a top piece and a center shelf. The spacious drawer consists of a base and four side pieces with one piece pre-drilled to accommodate a knob. I started by assembling the main structure and drawer. I then painted any parts that were not going to be papered and added decorative paper. The last step was to add images from the collage sheets to the sides, back, and top of the bookcase. I also added dimensional elements like the greenery and birds. 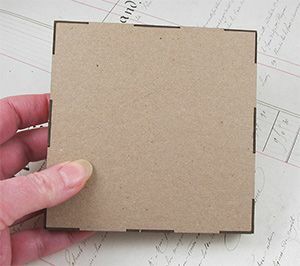 The ATC Books come in a simple to assemble kit. There are pieces for the deep side of the book, a cover, and a spine. For this project I made three books, each demonstrating a possible use. In one book I stored a stack of ATCs, in another I inserted paper that was accordion folded for attaching ATCs and in the last one is a shadow box book. To bind together the accordion folded book example, I used bookbinding tape which is also referred to as paper tape. The tape has sturdy fabric on one side and adhesive on the other. You can purchase it online or at bookbinding stores and it comes in different colors. I usually stick with white for more flexibility, as it can be colored with paint or stained, it can be stamped or you can apply rub-ons. 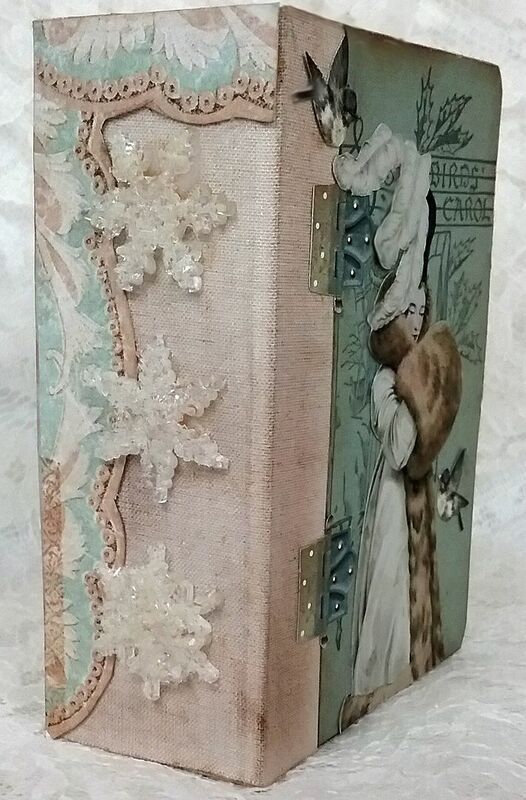 For two of the books, I used ribbon as a closure by gluing it to the front and back of the book before adding paper and collage sheet images. For all of the books, I glued the spine to the side of the back section of the book. To attach the paper tape, I first cut a section based on the size of the book. I removed the backing from the adhesive side of the tape and attached it to the front of the book. Next, I wrapped the tape around the spine and then around to the back of the book. 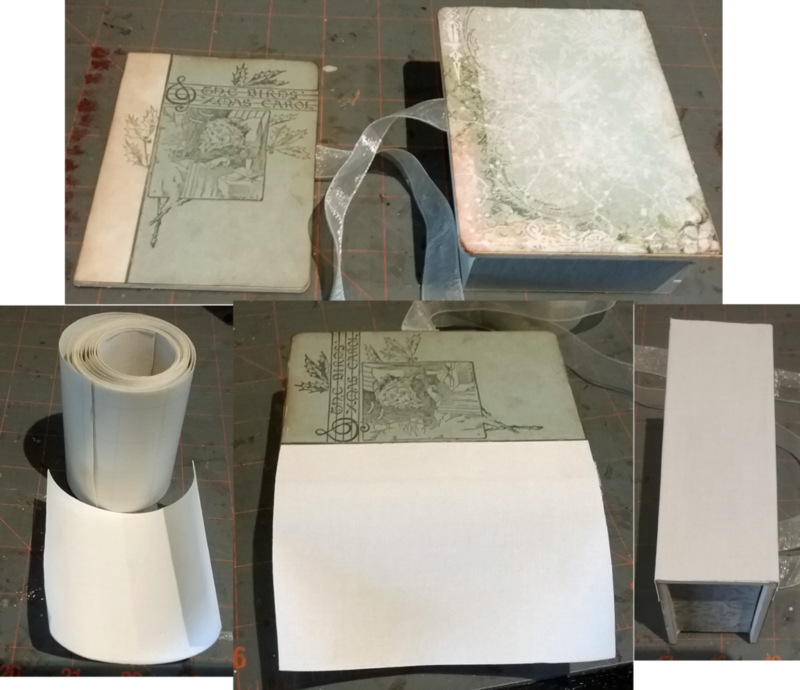 I inked the tape and added paper, collage sheet images, and other embellishments to the front, back, and spine of the book. 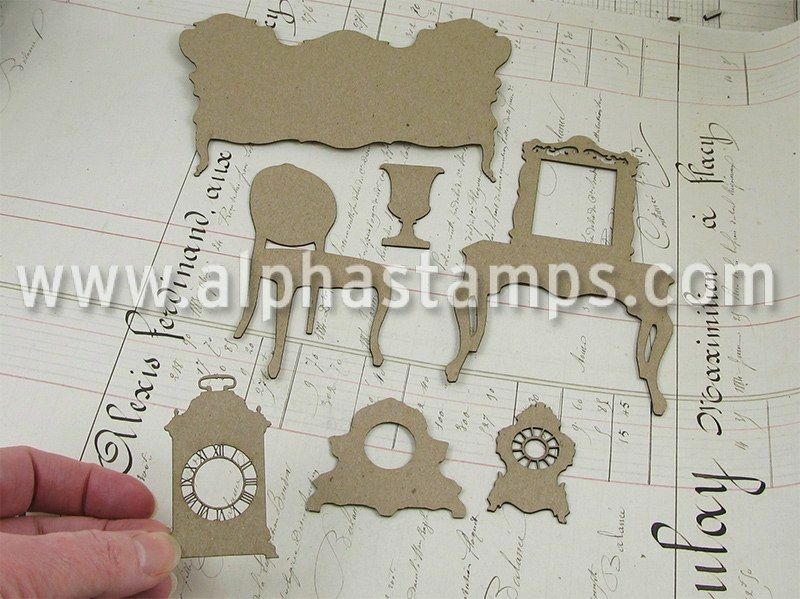 To create the table for the shadowbox; I used a die-cut chipboard image of a table that comes as part of a set of furniture. I cut off the bottom of the legs as the table would have been too high for the opening of the book. 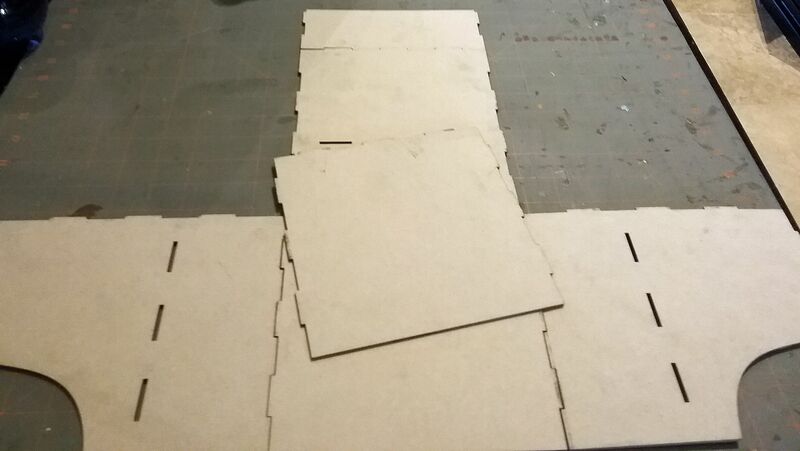 Next, I cut a piece of heavy chipboard the width of the book opening and slightly shallower. 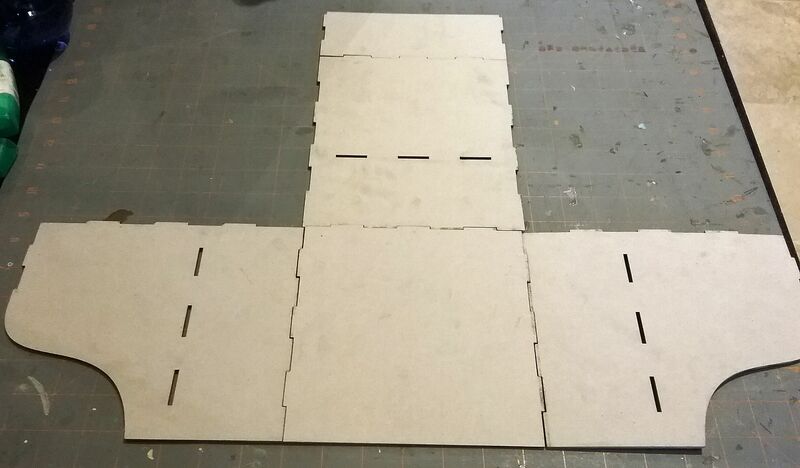 Then, I slightly bent the table and glued it to the chipboard. 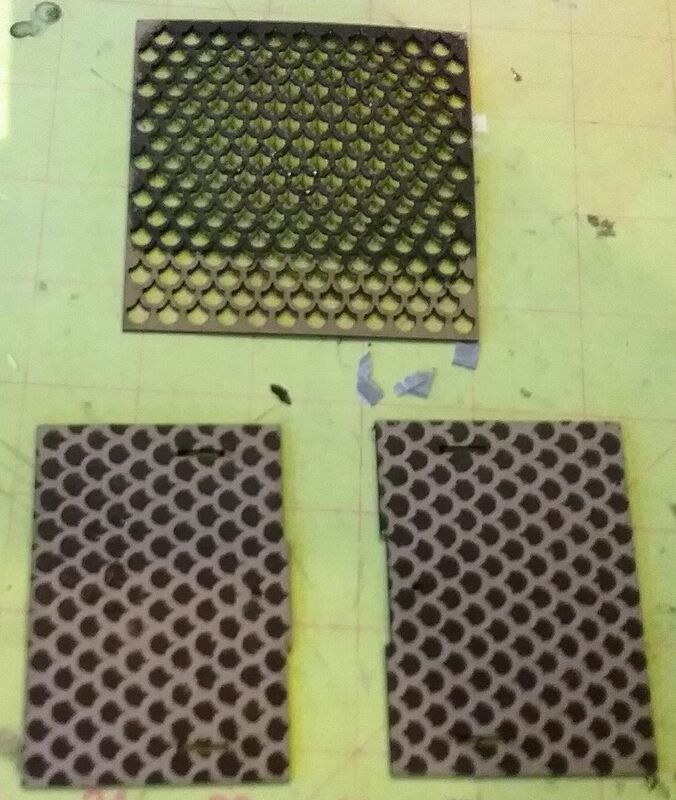 For support, I attached square beads to the back of the table and to the table top. 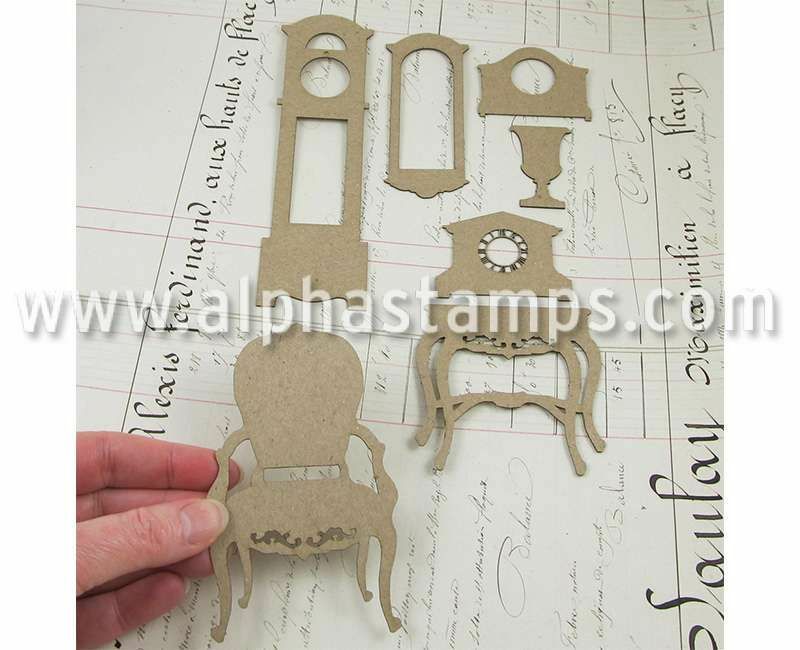 The clock is also a die-cut image of a clock that comes as part of a different set of furniture. 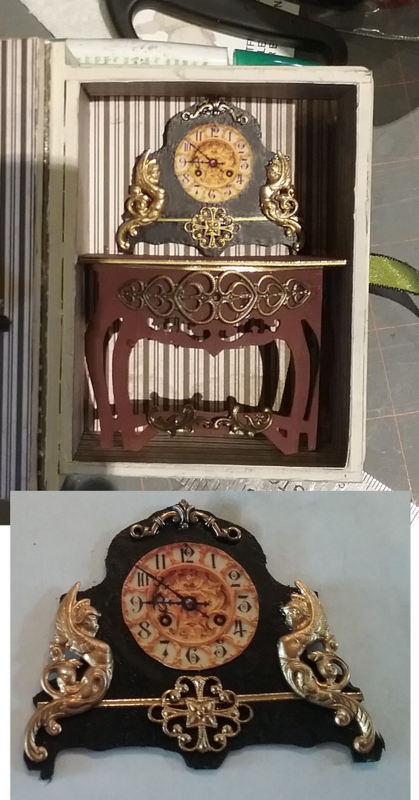 To make the clock more realistic, I added brass embellishments and gold stickers which I also added to the table. 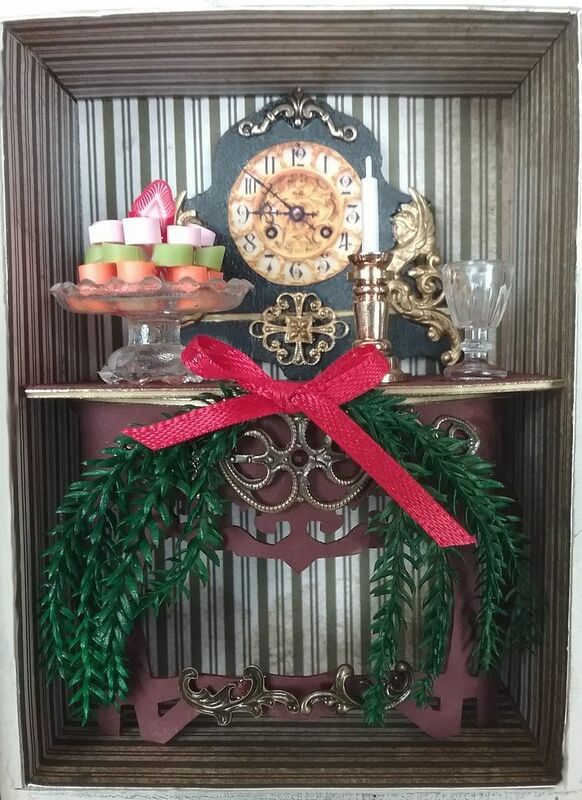 I dressed up the front of the table with greenery and the top with a cake plate stacked with polymer clay goodies, a candlestick and glass. Subscribe to my YouTube Tutorial Channel. Click on the image below for video tutorials and information on how to assemble and decorate a two story house. Click on the image below for video tutorials and information on how to build a Halloween Village. 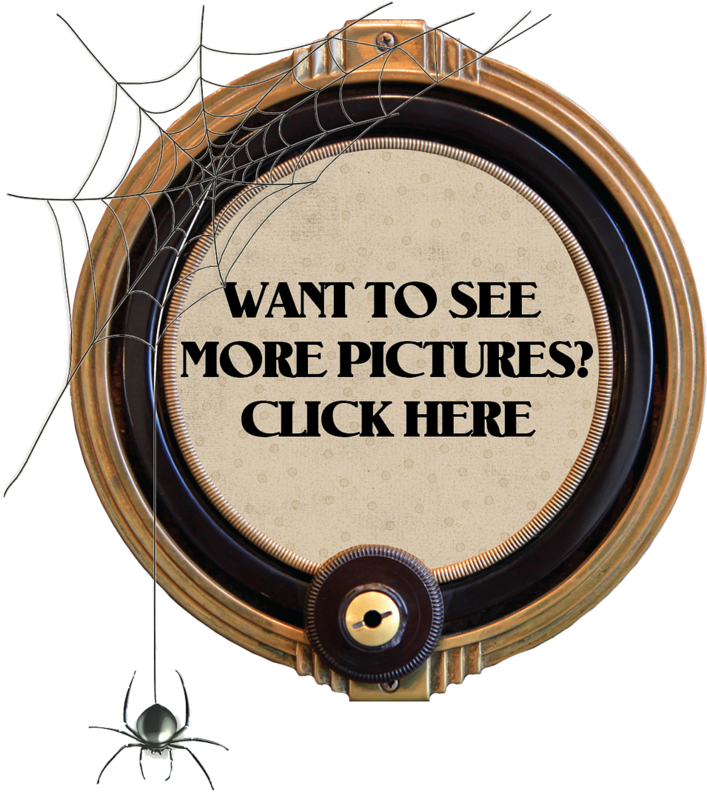 Click on the image below for video tutorials on how to build a Halloween Carnival. 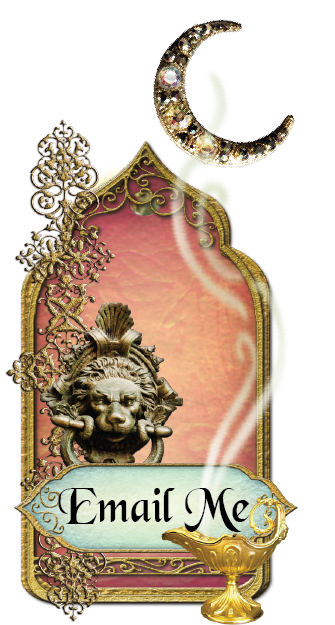 Click on the image below for video tutorials and information on how to build a witches apothecary. © 2015 Laura CARSON © 2010-2017 ARTFULLY MUSINGAll names, logos and designs are the property of their respective owners.All Rights Reserved unless content and images are noted to be available for download. Theme images by naphtalina. Powered by Blogger.